Ok, now that the official rules of including the above paragraph are completed, let me tell you about March challenge. We had to make lasagna with bechamel sauce, ragu, and most importantly hand-made noodles!!! I also did not feel like eating the entire lasagna on my own, so my friends Jenn, Laura and Wendy joined me for dinner a few weeks ago. And now to the lasagna! For the ragu sauce I decided to come up with my own recipe using premade tomato sauce, ground beef, mushrooms, carrots, thyme and dried hot peppers. For the bechamel sauce I followed the recipe provided, but decided not to add the nutmeg: I'm not a huge fan. Instead, I added a few pinches of chili powder. The sauce came together without a problem, but I had to add quite a bit of milk to make it thinner once I re-heated it for the use in the lasagna. Using a medium-sized saucepan, melt the butter over low to medium heat. Sift over the flour, whisk until smooth, and then stir (without stopping) for about 3 minutes. Whisk in the milk a little at a time and keep the mixture smooth. Bring to a slow simmer, and stir 3 to 4 minutes, or until the sauce thickens. Cook, stirring, for about 5 minutes, until the sauce thickens. Season with salt and pepper. You basically pile your flour on a clean surface. Make a well inside of it. Drop eggs and spinach into the well and whisk the two together. 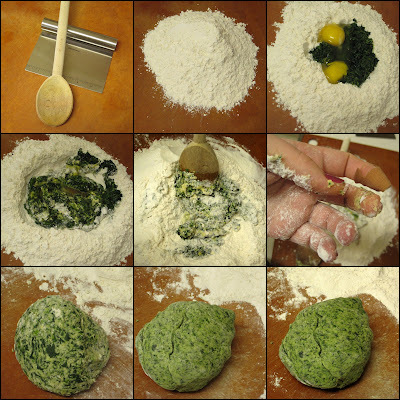 Then slowly start incorporating the flour into the egg/spinach mixture. It will be a mess, but trust the process! Eventually you'll have a nice ball of dough (after at least 10 minutes of kneading!). I actually had quite a bit of flour left over...not quite sure why. I used the manual pasta machine to stretch the dough into lasagna noodles. I then cooked it for about 2 minutes before starting to layer the lasagna. The layers are as follows: bechamel, noodles, bechamel, ragu, Parmesan, repeat. End with noodles, bechamel, Parmesan. Bake at 350 covered for 40 minutes and then uncovered for 10. Let the lasagna sit for about 10 minutes before cutting into it. What can I say? I was pleasantly surprised! I did not think the bechamel sauce would work in this recipe. But it totally did. The girls liked the lasagna too (and Laura ended up not even missing the ricotta!). The pasta was so insanely thin (in a good way) that it pretty much just melted in your mouth. I have the leftover lasagna in the freezer to eat after my trip to Las Vegas. Speaking of Vegas, when you read this post on Thursday, March 27th, I will be in Vegas celebrating my 30th birthday: the long weekend with Anna and our friend Lera! I promise to return your comments once I come back. Can't wait to find out what challenge awaits the Daring Bakers in April! HAPPY BIRTHDAY!! Awesome job with the lasagna. I briefly considered getting a pasta roller, but it actually wasn't too hard to roll it out by friend. I love lasanga! Have a great time in Vegas! How fun! Your lasagna layers look absolutely PERFECT ... I'm impressed!! You did a fantastic job. My SO would have loved your changes; he loves spicy! Awesome lasagna - and great collage pictures! Happy birthday and hope you're having the time of your life in Vegas!!! Happy birthday! A great lasagne - sorry your finger was a casualty in the process. Great job on your challenge and it looks really delicious. Nice! I also really enjoyed the bechamel, even though I'm a total ricotta girl usually. Wow! Your in Vegas! Happy Birthday!!! The Lasagna looks deliciously scrumptious! 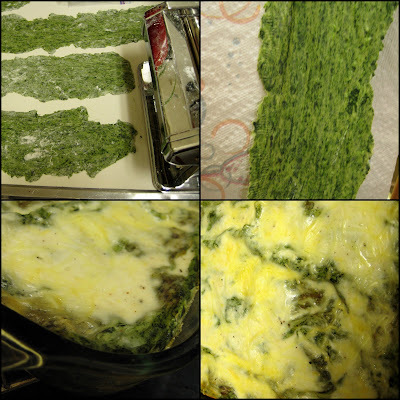 I am not too crazy about ricotta cheese, I love lazagna with bechamel sauce.I am always looking for ways to cook spinach. OMG, I seriously think that I had leave you a comment. Hmmm, must have brain scan soon, getting rusty here. Anyway, your lasagna look really delicious dear. Happy birthday, can't wait to hear about your trip! That lasagne sure looks mouthwatering good! That lasagna looks superbly yummie!! MMMMMMMMMMMMMMM... & Happy late birthday to you!!! Your lasagna looks wonderful. I loved the super thin pasta too. Have a great birthday trip! I must say, I enjoyed Darin' Bakers savory focus this month. Your lasagna and many others' have me wanting to make this version fo'sho! I love the collage of photos! !